Sponge in polyester and cellulose coupled with a fibre, both abrasive and no scratch, available in several thicknesses and in an extensive variety of colours. Suitable for the cleaning of various surfaces, available in different types whose sizes and shapes can be converted upon customers’ demand. Jumbo rolls of abrasive and no scratch fibre coupled with polyester sponge and wrapped around a cardboard core. Film wrapping upon request. Sheets of abrasive and no scratch fibre coupled with polyester and cellulose sponge, available in several sizes. Product supplied in parcels. 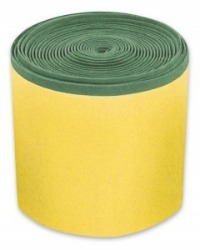 Strips of abrasive and no scratch fibre coupled with polyester sponge, available in several sizes. Hand-grip shaping also available. Product supplied in parcels. Abrasive and no scratch scourer sponges (polyester and cellulose) available in several sizes. Hand-grip and die-cut shapes available. Product supplied in boxes, parcels or loose in poly-bags.